It’s mid-June, which means that summer is approaching fast now. Officially anyway. It’s already summer for me since the beginning of May. 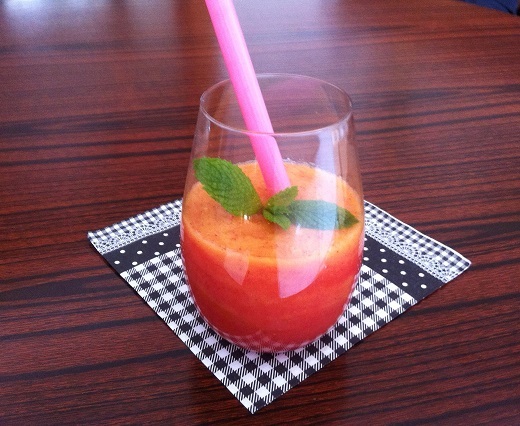 To continue with my summer recipes, I decided that I wanted to share a strawberry and peach smoothie. 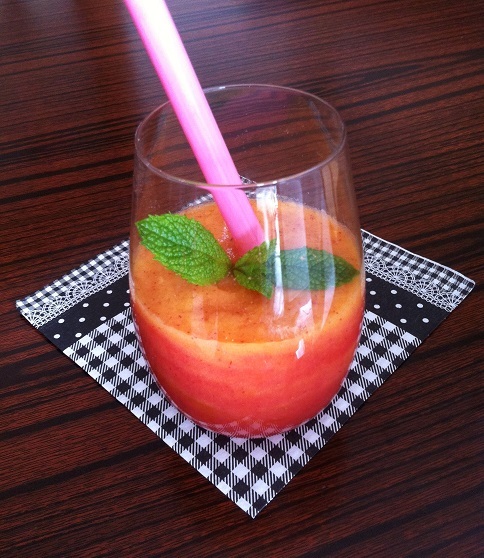 The blend of red and yellow orange create a gorgeous drink, perfect for a hot summer day. 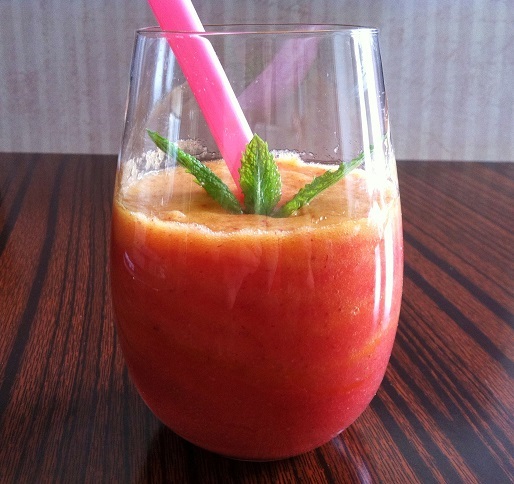 If you love strawberries and peaches as much as I do, you’ll enjoy this drink. It’s quick to make and filled with tons of Vitamin C.
When it’s hot out, which San Francisco rarely ever is until this year, I lose my appetite and all I want to do is drink something sweet and cold. What better way to satisfy that craving than with a healthy and delicious smoothie using summer fruits? Can you think anything more summery than strawberries and peaches? Or maybe I’m just partial to strawberries and peaches. Either way, this is definitely a blend of fruits I enjoy. First, chop up the strawberries and peaches. 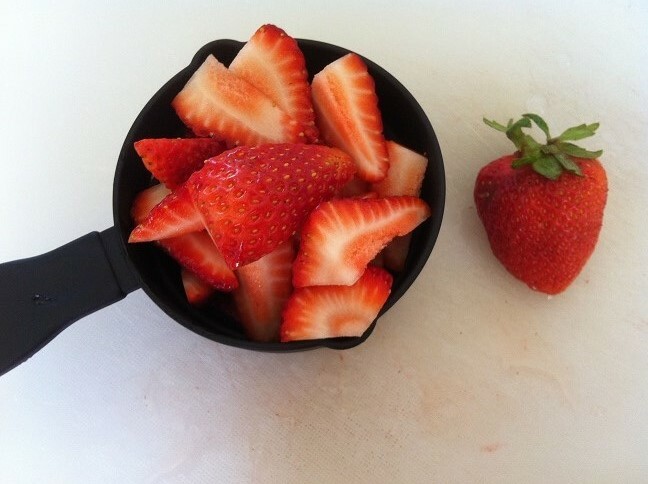 Then blend the strawberries with ice. Once the strawberries become as smooth as you like, taste the smoothie. The reason for this is because every batch of strawberries is different. Some strawberries are more sweet than others. Sometimes it’s sour. If you like sour smoothies, then leave the drink as is. However, if it’s too sour, add your preferred sweetener until it’s perfect for you. Quickly blend the sweetener into the smoothie. Pour the smoothie into each cup. Next, blend the peaches with ice until it becomes the consistency you like. 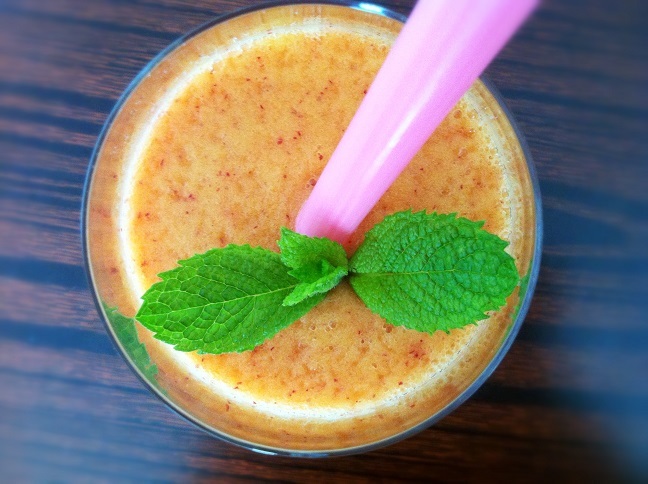 Again, see if the peach smoothie is perfect for your taste. If not, add a little bit of sweetener. Play with the flavor until it’s perfect for you. Pour the peach smoothie into the cups on top of the strawberry portion. The peach smoothie will sink down into the center. 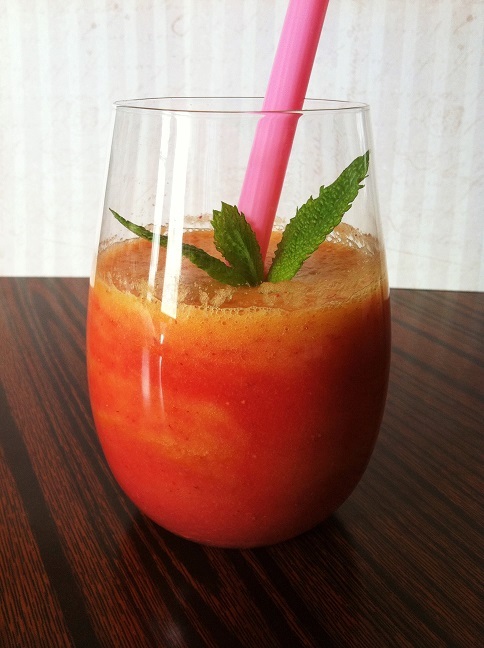 Use a straw or a chopstick to swirl the smoothie from the center to the outer edges to create the swirled look. Serve the smoothies cold and enjoy! Looks yummy, But I can’t eat strawberries, i come out in a rash down my neck. Wished i could. Can we substitute strawberries with mangoes? It looks delicious! Great idea for summer, thank your for sharing! Thanks, Joanna! I love strawberries and peaches together. 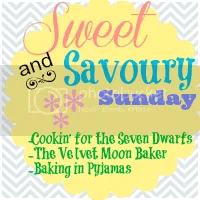 And since they’re naturally sweet, most of them anyway, some were super sour, there was no need to add extra sweetener. This looks lovely! Can’t wait to try! I’m in Louisiana right now and strawberries and peaches are at their peak. A perfect blending – sorry for the lame joke. Thanks for the like. Your site looks great – will use it for inspiration. Timing is everything. 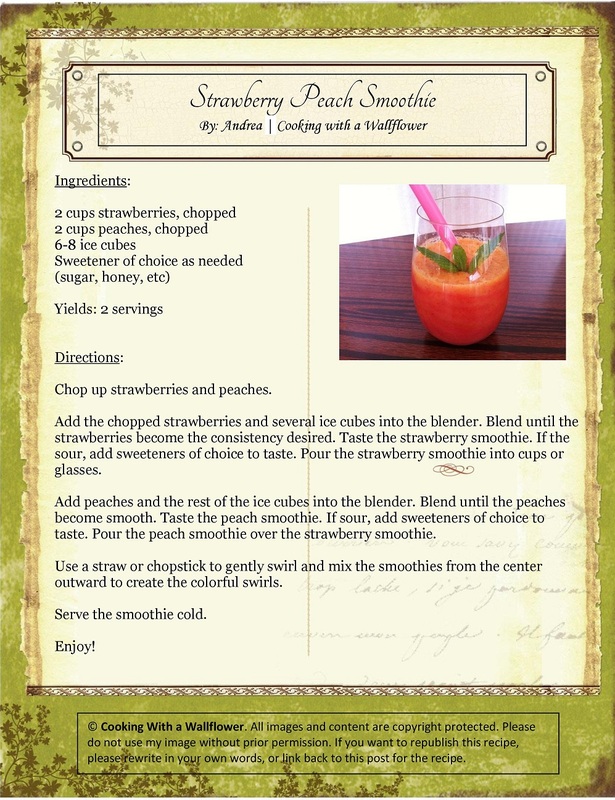 It is heating up here in Virginia and I will definitely be trying this smoothie! Thanks for sharing. Such a pretty drink! 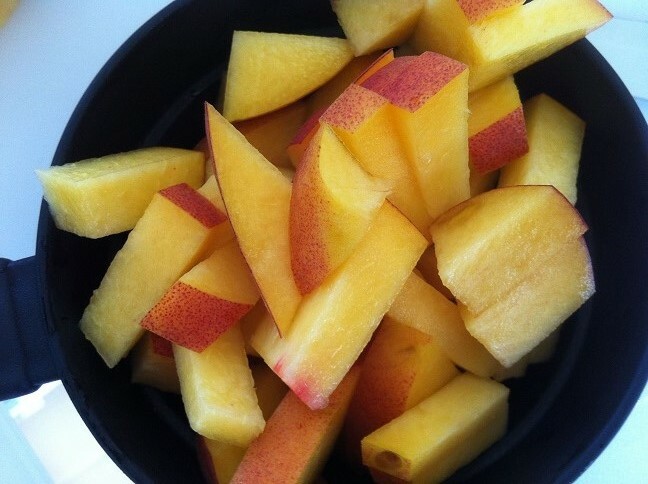 I love both strawberries and peaches. Perfect for an Arizona summer! Wow this is awesome! 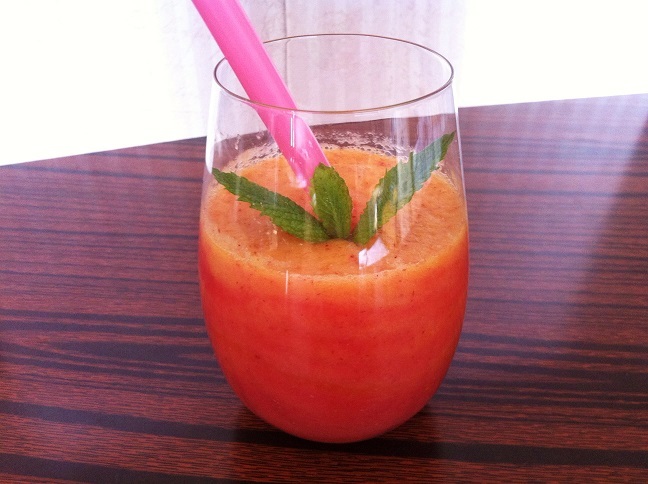 My favourite smoothie flavours are a blend of strawberry, peach, and mango!